July was a record breaking month for the number of passengers using London’s major airport in 2017. And, with better ‘load factors’ and larger aircraft operating from its 2 runways, the number of flights apparently did not increase. Gensler’s design for San Francisco International Airport’s renovated Terminal 2 (SFO T2) sets a new benchmark for contemporary air travel in a terminal highlighting the Bay Area’s distinct culture through its design, art and epicurean delights. Registered with the United States Green Building Council, the terminal aims to become the first LEED Gold certified terminal in the United States. The 640,000-square-foot terminal features progressive sustainability measures that strive to inspire people to live more sustainably. 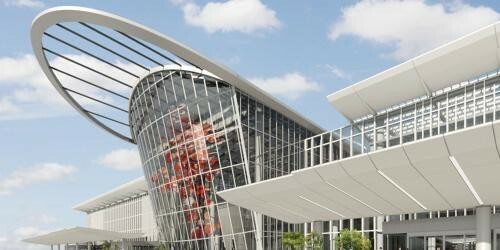 Fentress Architects, designer of the Terminal 2 at Raleigh-Durham International Airport (RDU) in North Carolina, has announced the opening of Terminal 2’s final phase, celebrated with a ribbon-cutting at 4:30 p.m. on Monday, January 24, 2011 at RDU. Terminal 2 is the world’s first major airport with a lenticular wood truss structure supporting the roof, which creates a warm, inviting passenger experience and a sense of place unlike any other airport in the world.